Posted by irishelectionliterature in Fianna Fáil. There will be much much more to read on the future of Fianna Fail over the next while, but O’Donoghues speech gave an indication of how much Fianna Fail have depended on patronage and The Parish Pump to keep in power. Over the past few weeks, I’m sure too you will have got leaflets or personally addressed letters detailing all the local achievements of Fianna Fail. That Patronage is gone for the foreseeable future. The ULA polled 59,423 votes getting around 2.7% of the vote nationally and winning five seats. Left of Centre Independents polled 55145 votes around 2.5% winning six seats. That is around half the vote Labour got in 2007. Been busy the past week so forgot to post up a link to an article on the excellent Ephemeral Left. Mick Murphy Diary of the GAMA strike, has text from Mick as well as a documentary on the GAMA strike. Amongst other things it showed the benefit of having Left TDs in the Dail. Posted by WorldbyStorm in Ainriall - Belfast Anarchists, Irish Left Online Document Archive. This document begins to fill a gap in the Archive. We have, unfortunately, very limited samples of Irish Anarchist material – and those documents we do have were very kindly donated by Alan MacSimoin and the Workers Solidarity Movement. The 12 page A5 document dates from early 1987 and was as far as can be determined produced by the Belfast Anarchist Collective, or a successor group, and was one of a series of regularly published leaflets [for more on the BAC see here]. The contents is strongly positioned within an anarchist viewpoint specific to Belfast during this time. 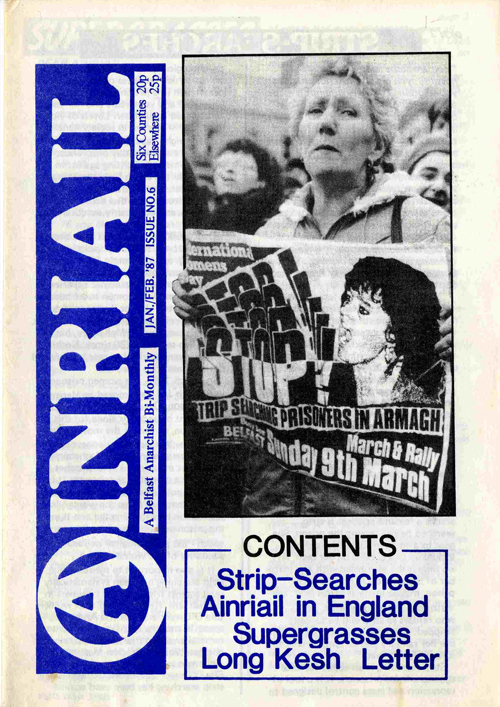 Therefore it has articles on Strip-searches and an interesting two page contribution from Anthony McIntyre and Micky McMullan, both Republican prisoners at the time in Long Kesh under the heading ‘Ideas from Long Kesh’. The following article is not meant to be a definitive analysis of present republican strategy in the struggle for Irish unity. However the issues it deals with are of consequence, and should not be ignored by Republicans when reflecting on the nature of the present struggle and the direction in which it is ultimately leading us. Indeed it is telling how critical they are of ‘armed struggle’ – they write that ‘the present shape of the armed struggle – as distinctly opposed to the legitimate right of a suppressed people to use armed struggle – is in no way conducive to long term progress being made. Not only has it failed to remove the British, or substantially alter their resolve it has – because of its emphasis on ‘local targets’ given Northern Nationalists the peculiar appearance of ‘otherness’ in the eyes of many people in the South’. There is a useful account of an Ainriail visit to England and a video and speaking tour which was organised by the Direct Action Movement, ‘an anarcho-syndicalist grouping’. The video chosen was ‘the Plastic Bullet video, ‘The Deadly Truth’ and ‘along with the half-hour talk, ensured a wide ranging debate on the role of the British state in Ireland’. There is clear and common understanding by the two [anarchist] groups in the north, Ballymena and Belfast, and the Workers Solidarity Movement in Dublin and Cork, that we are anti-imperialist. That we are opposed to the division of the working class in the north, the division of the working class north and south, opposed to both sectarianism and partition, and to the cause of both – the British state’s presence in Ireland. And further more to the incorporation of Ireland in NATO. But as anti-imperialists we are also opposed to the relations of production based on capitalist exploitation, whether from local or multi-national sources. Herein lies one of our differences with the republican movement, which is the largest, most active and influential of the anti-imperialist groups. At best they have a policy of nationalistaion, ie state run industry, and at worst a benign free capitalist attitude which favours more constraint on enterprises eg heavier taxation. There are more copies and further anarchist material which will be added to the Archive over the year. The Road to the Peace Process? Enda Kenny interview..in today’s Mail. Given that it’s culled from three years of interviews with Jason O’Toole it doesn’t necessarily add any new insights, but that’s not to say it’s without interest. It was also his father who played a major role in moulding his political ideology. ‘I think he did leave two legacies to me politically – one was that you work hard and the second was that you stand by your word. They are very fundamental building blocks in the type of person that you become. You word is your bond here. I was born in Casletbar. ‘He was a man who really had a great understanding of human nature. I think people in his years in the Dáil made an agreement and stood by it. A gentleman’s agreement and that’s the way they got on. Politics today is, of course, very different in the way things communicated, then and now, and all the facilities and all of that. ‘If you were to ask me a straight question, I would say it was his sense of equality for people, whoever you were, you were going to get the same sense of fairness from him. ‘In that sense it was a lesson in politics to treat everybody the same. And it’s a sense of fairness on behalf of all the people. But is that a political ideology? All our three children were born when I was Minister for Tourism and Trade and you were away a lot. And his love for this is based on? Well, let’s hope some of that finds its way into more… concrete… aspects of the polity. Posted by WorldbyStorm in Sunday Independent Stupid Statement of the Week, Uncategorized. In what can be properly described as a defining moment in the history of the nation, Fianna Fail has suffered its worst ever defeat in a General Election, the outcome of which has, in an almost apocalyptic fashion, swept away 90 years of civil war politics in Ireland. ‘Swept away 90 years of civil war politics in Ireland’… er… a bit early to be making that statement, no? Kenny must now prepare for a Kulturkampf with RTE, that useful German word which covers any ideological struggle short of shooting. The biggest kulturkampf fought on this island was the battle for minds and hearts during the 30-year armed struggle of the Provo IRA. The most important weapon in this war was Section 31 of the Broadcasting Act. This prevented the Provos from using RTE to make the propaganda at which they proved so polished once Section 31 was lifted. Let’s put aside the usual public sector bashing stuff that has become his stock in trade. Reading about the Kulturkampf I wonder does he realise what a curious notion that is to introduce in a democracy, and, more important from a purely utilitarian position, does he know how effective it actually was. Bismarck realized his Kulturkampf was a failure when secular and socialist elements use the opportunity to attack all religion. In the long run, the most significant result was the mobilization of the Catholic voters, and their insistence on protecting their church. In the elections of 1874, the Center party doubled its popular vote, and became the second-largest party in the national parliament– and remained a powerful force for the next 60 years, so that after Bismarck it became difficult to form a government without their support. .
Let’s contemplate the utility of the anti-PS language used to date. Fianna Fáil broken, Labour getting its best ever result. The further left on line to get their best ever result. Sinn Féin [and here we see the effectiveness of anti-Republican rhetoric as well] on line to get some 10 per cent or so of seats in the Dáil. The battles about Section 31 left behind a legacy of prejudice against me and my politics which persist to this day. Although I was active in the peace process (supplying soundbites to David Trimble like “Northern Ireland was a cold house for Catholics”), I have rarely been seen or heard on RTE News and Current Affairs programmes since 1990 — a situation which does not apply to the Programmes Division of television. If I am not banned, then the News Division hasn’t a clue how to balance a programme. For example, for nearly four years now I have been the chief spokesperson in the Seanad calling for public sector reform. But I was never asked to contribute to programmes such as The Week in Politics, which discussed public sector reform in that period. Likewise, I was not asked to evaluate the recent leaders’ debates. Yet few have as much expertise in this field. Over the years I have worked either as a media adviser or as a speechwriter for politicians as diverse as Proinsias De Rossa, Mary Robinson, John Bruton and David Trimble. Could it be that my expertise itself is a problem? Is it intellectual insecurity? Or the likelihood that I would contradict the reflex RTE consensus that long dismissed Enda Kenny as a lightweight? He identified the Independents as Wexford poll-topper, Mick Wallace; Maureen O’Sullivan (Dublin Central); Finian McGrath (Dublin North Central); Noel Grealish (Galway West); Luke ‘Ming’ Flanagan (Roscommon/South Leitrim); and Stephen Donnelly (Wicklow). The Labour Party at 31 seats and more to come surely. This is all that 2007 was meant to be [albeit without the apostate Green Party, and one wonders what will happen to them short, medium and long term now that they are effectively cut off from both local and national representation], but somehow was delayed four years. It’s going to be a very very strange Dáil, one where the opposition is broken into fractions, but big enough fractions at that. And as with 2007 one element of the centre left will detach to join with Fine Gael. And look at Fine Gael, and – in contrast to its former dominance – squint real hard to see Fianna Fáil. Only fourteen seats as this is written at ten to nine. Fourteen. Though they’ll get a scatter more. Well, it’s a change, and no doubt about it. At least on one level. Whether on the levels that count it will make any great difference as we emerge from our three week holiday from the economic situation is a different matter. And what the dynamics of a strongly left tinged opposition [indeed leftwing in whole bar FF and some of the Independents] sitting across from Fine Gael/Labour are going to be and how they will play out in the face of the billions yet to be taken from public expenditure is a most interesting question. Well well well. I shouldn’t have let my innate caution be swayed by rising poll numbers towards the end of the campaign for Fine Gael, for if the RTÉ exit poll is correct, and usual caveats apply given that national figures won’t map precisely onto local contests then FG settled back into the mid-range of the 30s. And that implies that all the super-heated chatter about FG getting up to 80 seats has been very very wide of the mark. …the poll predicts that Fine Gael will get 36.1% – the party’s best result since November 1982, but some way short of what it would need for an overall majority. Labour is in second place on 20.5%, which would be its best ever share of the vote. The party is ahead of Fine Gael in Dublin. Fianna Fáil support is put at just 15.1%, by far its worst ever General Election result, and signalling an electoral wipeout. Sinn Féin support is put at 10.1%, again a record, while the Greens are on 2.7%, which could see the party save some seats. Independents and Others get the support of 15.5% – a very high figure, though it may be spread quite thinly given the number of candidates, and where those votes transfer could be crucial to the final outcome. Dismal for Fianna Fáil. Not as bad as it might have been for the Labour Party – sorry, let me amend that, it’s an excellent result for the LP by any measure and still ahead in Dublin. This could be interesting. Actually quite good for Sinn Féin, they may wonder about that LP Dublin figure, remarkably good for Independents, almost stunningly so given that they collectively with smaller parties had less than half that figure in the last election, but with the problem that transfers will tell all and is that a hint of good news for the Green Party? Looks like a Fine Gael/Labour coalition is very firmly set to be the political future here. ADDENDUM; Adding a bit of further caution I’d imagine it’s highly likely that both the LP and SF figures will settle just a little more. We’ll see.